Senator Agnes Mambe moves in procession with the Èbòngó leaders after her initiation in Ekondo Titi, 2009. 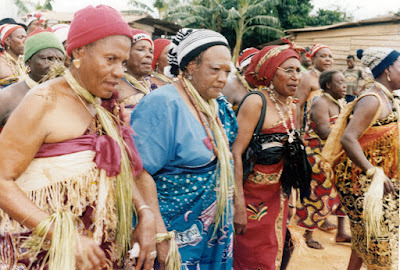 Èbòngó is a traditional society for royal women of the Bàlóndó-speaking area. Senator Agnes Mambe, President of the Cameroon Traditional Women’s Society, is an active civil society leader in the South West region. She was initiated by the members of the Èbòngó society in recognition of her lifetime achievement. The Ékpè chiefs collectively select one elder woman from the Èbòngó society to receive the title of Manyang-Aro (in Éjághám) or Nyang’a Mboka (in Bàlóndó), or ‘Head of Women’s Traditional Leaders in the Community’ in English. The Manyang-Aro is the representative of women to the Ékpè society. 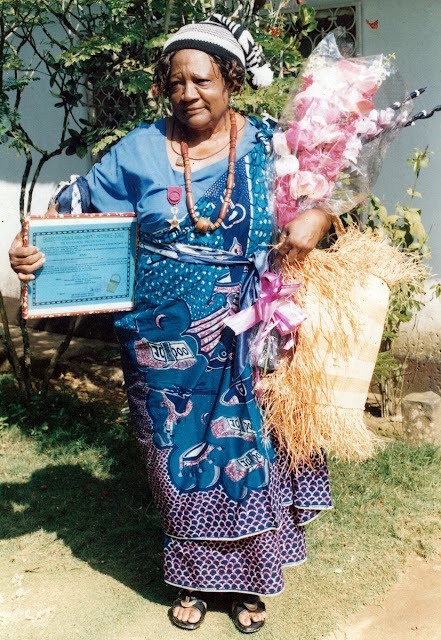 Senator Mambe with the certificate received from the Ekondo Titi Council Area Chiefs Conference, 2009.